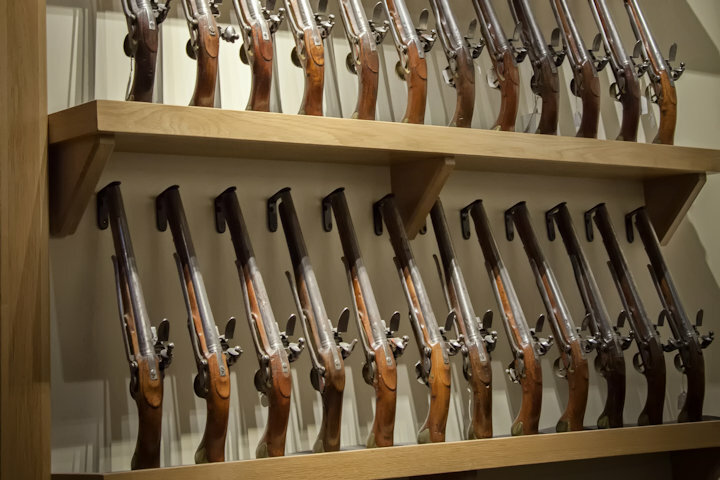 A gun rack is a convenient addition to your man shack or trophy room that you can build yourself. By using wood instead of hard plastic or metal, you can affordably craft a simple rack that will store your long guns and won’t make marks or impressions on the guns’ wood finish. Making your rack a DIY project will allow you to choose a style that matches well with your existing furniture and weapons. If you build it well enough, it might just get passed down as a family heirloom. We recommend a 2×6 for your base and 4x1s or 3x1s for the rest of the rack. If you prefer, you can add a larger board as a back panel however it’s not required. When selecting your lumber, there are a few critical things to keep in mind. Make sure the wood you use has an acceptable moisture content — getting this wrong can drastically shorten the life of your finished gun rack. It’s also a good idea to consider how the finish on your wood will interact with the finish on your guns. Wood makes a nice material for a gun rack because it’s sturdy but softer than metal or plastic. This means the contact points on your guns should not stain or blemish the finish, but you should do a little research about how your gun is treated, so you can be confident you won’t be damaging your firearm by letting it sit in your new rack. With your preparation done, you can get down to the business of gun rack building. It’s time to cut your lumber if it’s not already sized. Start with the base of your rack, which might vary anywhere from 8 to 16 inches wide. This is your 2×6, and all your other lumber will attach to it. Add the arms of the rack, which are 1-inch thick boards running up either side of the rack. At this stage, you should be working with the rack laying flat so as not to put extra stress on the arms. If you have a drill press available, you can add some nicely contoured slots. The process takes longer with a hole saw, but stay with it, and you’ll get it done nevertheless. If your rack is going to hold pistols as well as rifles, you can add barrel holders using shorter 4×1 pieces. Finally, add a top to the rack to give it structural integrity. The example above includes a top with some lovely contouring, which is a nice way to add some character to your otherwise square rack. With the difficult part over, all that’s left to do is protect your gun rack from the ravages of time by sealing it. You’ve got several options here. If the rack isn’t going to be outdoors, it doesn’t need to be tremendously waterproof — however, a nice stain or polyurethane coating will keep moisture out and give a warm, rich finish. You can also paint the rack if you want a more intense color. Your gun rack is finished, congratulations! All that’s left to do is place your weapons in their new home. Now when your friends visit, you can take pride in showing off your firearms in a hand-crafted rack that you built yourself, and you saved some money doing it!